This article appeared in our August 2008 issue. 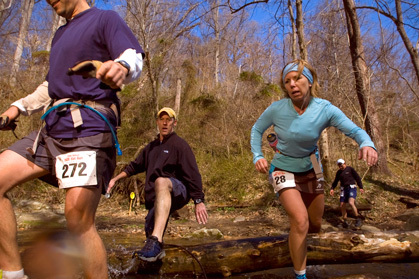 To mid-Atlantic ultrarunners, March Madness isn’t about beer, chips and college hoops. We gladly forego the comfort of sofas and barstools and head for northeastern Maryland, to a park that’s spitting distance from where the Susquehanna River dumps into Chesapeake Bay. We conduct personal rituals, lubricate body parts and layer according to the latest forecast. We hit the trail en masse to give our legs and lungs the first real test of the year: the HAT 50K. The race’s 20th anniversary last March was my 15th time toeing the line. As I glance around in the brisk morning air, my mind fills with the usual abstractions and thoughts. If only I’d had one more long run. I see many repeat offenders, familiar faces I haven’t seen since the fall. Are you running with gloves? And there are more starters, more new faces than ever before. Yo, what’s the skinny on the course change? Far too many people look lean, fierce and overly fit. Jeff Hinte (the “H” in HAT) gives the start signal and Phil Anderson (the “A”) heads out across the field on his mountain bike, leading participants onto a short out-and-back road section that acts as a prelude to the trails (the “T”). Within minutes, we pass the turn-of-the-century buildings that comprise the Steppingstone Museum, run through the Pavilion-turned-aid-station and disappear into the woods. Hinte, of Aberdeen, Maryland, and Anderson, of nearby Bel Air, first ventured into ultrarunning in the fall of 1987 at Maryland’s famous JFK 50 Mile, and as they extended the length of their training runs in preparation for a second attempt, they thought about staging a race of their own. “We had a great 7.5-mile loop in the Susquehanna State Park,” recalls Hinte, “and figured four laps was 3.8 miles longer than a marathon. That’s an ultra by any standard, so we gave it a shot.” Of the 46 who started the inaugural HAT run, 17 finished. The race doubled in size the following year and was led by its first international entrant, a Russian ultrarunner named Nail Bairmgalin on his first visit to the United States. Six of the 48 finishers were female. 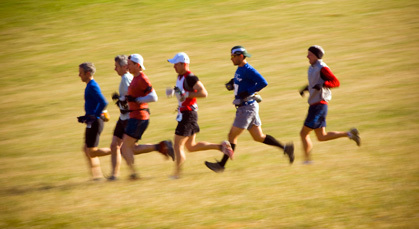 Today, the field reaches its 450-person limit well in advance, due largely to the co-director’s focus on making the experience about the runners. “We have strived to improve the quality of the event every year,” says Hinte, “and our incredible volunteers are the main reason we have been able to succeed.” Though the course has changed many times over the years (it currently consists of a short starting loop followed by two repeats of a long loop), the aid stations are well placed and liberally stocked with everything from soup to nuts. And then there’s the schwag. 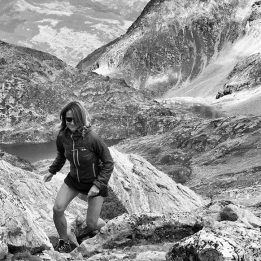 “My philosophy is that if I wouldn’t use it, I won’t give it to runners,” says Hinte. There’s always a technical running shirt, goodie bag and bonus finisher’s reward. The awards have evolved over the years, with hydration packs or courier bags replacing medals and plaques. 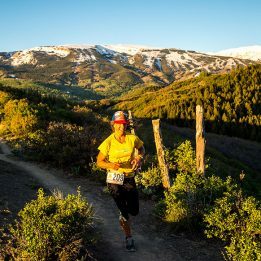 “If you finish the race, you get everything you paid and then some back in good, useful gear.” With a number of top-10 finishes at the Wasatch and Vermont 100s and a victory at the original Old Dominion 100-miler, Hinte has used his own HAT caps, coolers, jackets and vests with impressive results. Two miles into the race this year, the trash talk has already begun. “Do you know who that is?” asks an unfamiliar voice from behind me, pointing to a red-shirted runner who is already building a lead. “Nope,” someone responds, toying with the dangling bait. “Do you know who we are?” asks 42-year-old Ian Schouten, of Lititz, Pennsylvania, nudging my arm and flashing a wink. Schouten, a fixture at the top of Pennsylvania’s trail-running scene for years and two-time HAT winner, is accompanied by 35-year-old Alex Barth of Chester Springs, Pennsylvania. Barth is another scary-good talent who has been winning everything in sight in recent years—including the Seneca Creek Trail Marathon, Nipmuck Marathon and Long Island Greenbelt Trail 50K—and his best still lies ahead. The three of us are running side by side, reminiscing about a winter training weekend that saw us fastpacking through snow-filled woods from dawn until dusk. “Redpath might be good,” adds Schouten, “but he’ll be looking like that coyote we saw out there hiking by the end of the race. Dead meat is all I can say.” We burst into laughter at the words of bravado, but I for one, have nothing to say. The HAT course punished Barth last year, and, despite his victories, it has taken its toll on Schouten as often as not. 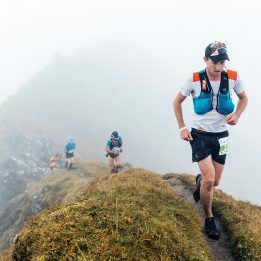 Described by Hinte as an event that is “both accessible to first-time ultrarunners and a challenging early season training run for veterans,” the HAT course seems deceptively runable early on. There are no huge climbs, no massive descents, no super-technical sections. With the exception of a two-mile stretch of bitumen/gravel road in the middle of the big loop, though, there’s always something going on. The winding singletrack is some of Maryland’s most popular for mountain bikers, and it serves up challenging roller-coaster-like running, with continuous one- to three-hundred-foot losses and gains. Today, the singletrack offers solid footing as it twists and turns through the deciduous forest. Running by an ancient hemlock, Schouten contemplates what the valley must have looked like before the 17th century settlers started timbering, farming and pulling coal from the earth. “Imagine this whole area covered in trees of that size,” he marvels as we swing around the several-hundred-year-old sentinel and peer into its six-foot diameter trunk. “Go ahead, Ian,” Barth jokes, “give us the natural history lesson. We’re all ears.” We round a corner and spook a trio of whitetail deer. They crash off through the woods and soon blend into the landscape. Though there are stretches of green and the odd stand of emergent flowers when we hit the open fields, the predominant color is brown. On any given year, the open stretches of field could be mucky or frozen, sun-baked or buffeted by bone-chilling wind. The weather might be sub-freezing with snow squalls or provide a spike of unseasonable heat. When wet, the HAT course gets like slick clay, and the pair of creek crossings can be waist deep or worse. When dry like today, careful rock hopping keeps the feet dry, but the conditions encourage foolhardiness. Speedsters beware. No single element of the course is especially daunting when viewed in isolation, but when combined, they can brew up a Perfect Storm and lead to disaster for even the most experienced racer. Schouten knows that well. HAT 2001 was our introductory meeting and laid the foundation for an intensely competitive, mutually supportive friendship that will last until we’re both long in the tooth. “Pretty typical for me,” I said. “I’m more tortoise than hare. Don’t let me hold you back though.” At the five-mile mark, Schouten took off, dragging several others with him. Perfect, I thought to myself. It’s going according to plan. This year, as I hit the series of climbs where I eventually overtook Schouten in 2001 (he held on in two of our next three meetings), I am alone with my thoughts. I have just passed the Rock Run Grist Mill, erected in 1794 by a prosperous businessman from Baltimore, and am once again high above the Susquehanna, looking down toward Chesapeake Bay. Distant sailboats on the blue water look like bright kites offset by the sky. Schouten and Barth have broken away in pursuit of Redpath and another runner. I hear footsteps behind me, but dismiss them immediately. This is only the first lap and there’s still a long way to go. Thoughts shift to the depth of competitors that have taken on HAT over the years. These are not the sentiments of most newcomers. Whether it’s the trail, the competition, the camaraderie or the people who put on the event, when you complete the HAT, chances are you’ll finish with a smile on your face. You’ll forget the pain as soon as you dig into the veggie chili and chase it with a homemade cookie or 12. You’ll be hooked—and welcomed into the fold. “You bet,” said 63-year-old Anderson at the start of the race when I asked him if he was running this year. “Once an ultrarunner, always an ultrarunner.” Despite suffering a stroke 11 months earlier, he hopped off the lead bike and joined the rest of us in celebrating the Equinox out on the trail. Seven hours and 34 minutes later, he was back at the finish area, greeting those who were still coming in. Barry Lewis is a Philadelphia-based writer with five HAT wins to his credit.